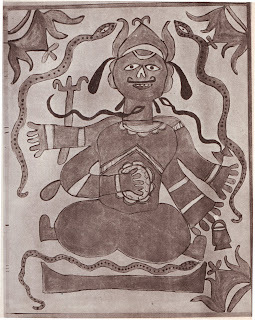 The ritual art of rural India are the visual expression and technological process of people living at several cultural, religious and sociological levels. They are the art of the people settled in the countryside with lives tuned to the rhythm of nature and its laws of cyclic change, and with a central concern with the earth and with harvesting. 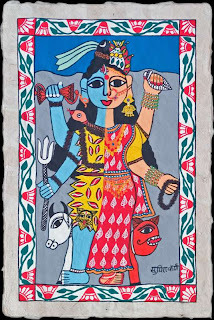 It is the art of people with memoirs of ancient migrations forced by war, epidemic, hunger and live myth that make the archaic Puranic Gods and legends contemporary. It is an art involved with household and fertility ritual within the hut and the village community. It is the art of fairs and festivals and pilgrimage, of song, dance and epic performance. 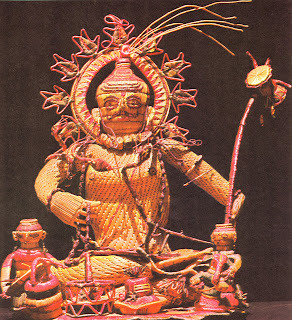 It is an art based on archaic technological processes and skills created by artisan communities to fulfil the functional needs of village societies, techniques that till recently had remained static for two thousand years. 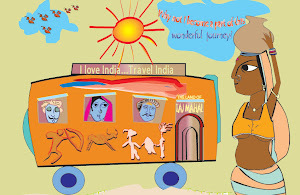 Ritual arts of rural India also include the visual expressions of nomadic people, the culture of wanderer. 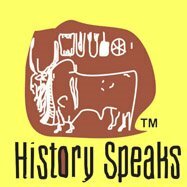 People exposed to changing landscape, travelling over the valleys and highlands of India; at times forming settled communities, establishing kingdoms, carrying with them the traditions and memoirs of vast spaces and of an original home on the plains of Northern India. Ritual art of the forest and mountain dwellers have mysterious sacredness reflecting their intimate kinship with animals, with trees, with stones and with water, with a central concern with fertility and with their ears close to the earth. Their interaction with the people of the settled plains borrowed epic myths and legends, with multitudinous gods, born of dream, of magic. 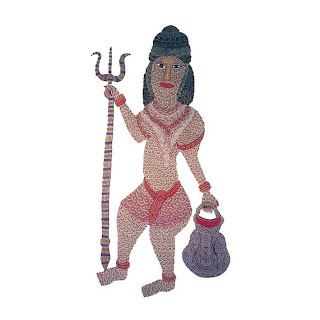 One of the main Puranic Gods is Shiva yet having strong folk and tribal manifestations. 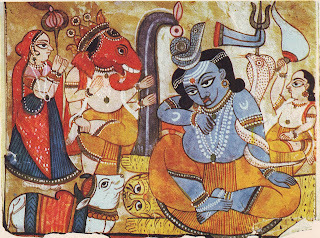 The antiquity of Shiva worship is shrouded in mysteries. 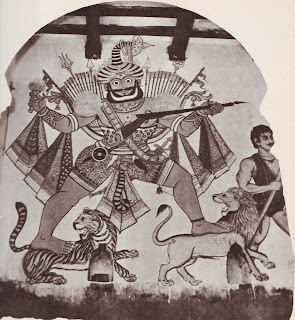 Archaeologists claim that the prototype of Shiva worship has been evident from the sites of Indus Valley Civilisation in the form of Pashupati – the protector of animals. 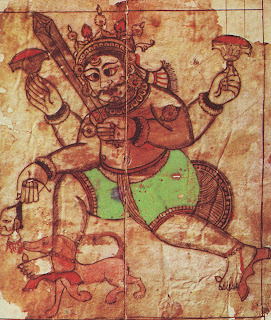 Rudra was the Vedic version of Shiva. 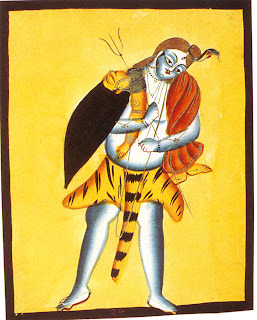 In contemporary India, Shiva is also known as Mallikarujuna, Nataraja, Gorakhnath, Virabhadra, and Lakulisa and so on. 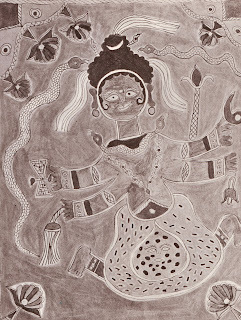 Though Shiva has been depicted in the walls of temples both in the anthropomorphic form and through symbolic representation – the lingam, it is the bazaar art that has homogenised the artistic representation of Shiva in most of Hindu households. 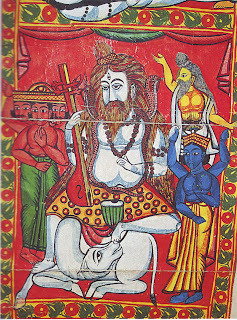 Yet in traditional urban centres, villages and in tribal hamlets the God Shiva is widely manifested in various stylistic representations in tune with the local lore, customs and geography. 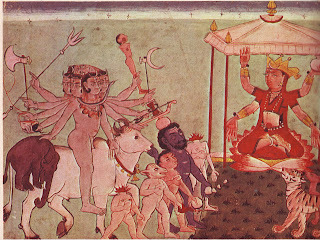 Shiva in many cases surprisingly coexists with village Grama Devatas (the village mothers of Non-Aryan origin), and sometime even with Muslim Pirs. A journey through the countryside of India provide us glimpses of Shiva in many unconventional forms, some with strong tribal influence, others with the experiences of nomads and in many cases with relation to local heroic deeds, all owing to the reflections of the various historical experiences of natives and their close understanding of life cycle and observation of nature. Following is a facinating story from Bengal. 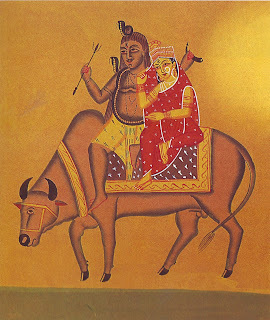 Long ago, the primeval goddess Adi-Shakti was born from the sweet of Lord Dharma. 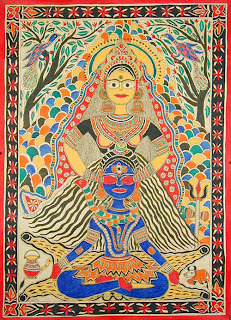 But soon after creating this daughter, Dharma went to the river bank to practice his meditation excercises. He remained absorbed in his own thoughts for fourteen long years. Finally, he was distributed by his air borne vehicle, the owl. This owl reminded him of his daughter and persuaded him to abandon his meditation and return home to check on her. He left behind one pot of honey and one pot of poison. During his absence the daughter became more and more desirous. Finally when she could not bear the feeling of any longer, she drank the poison. This made her pregnant. 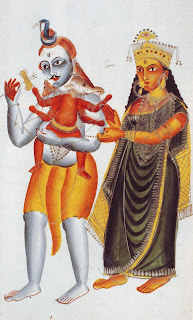 In due course she gave birth to the three great gods - Brahma, Vishnu and Shiva. All three of these sons were born blind. They were also very religious. They soon went back of a river to give themselves upto a divine contemplation. Seeing these three men absorbed thus in meditation, Dharma now determined to test them. So he floated down the river in the form of a pattid, he began to notice a terrible smell. So the sage took three palmful of water and ceremoniously sent the corpse on down the river. Next, the great Lord Dharma floated in front of Vishnu. The mighty Vishnu also noticed a foul smell and soon did the same, sending the corpse arrived in front of Shiva. When Shiva noticed the bad smell, however, he thought to himself, "How could there already be a smell of death when there has been no birth?" 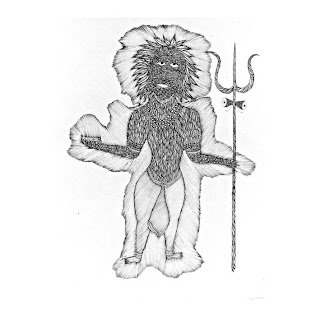 Shiva, being a famous master of mysteries, thus came to realize that this smell could be nothing more than an illusion created by the great Lord himself so instead of sending the body on down the river, Shiva grabbed a hold of it with his two hands and began to dance. He also realized that he had been the only one of his brothers to have recognised Lord Dharma in his concealed form. 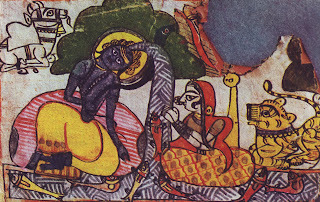 Dharma was very pleased with Shiva and responded by bestowing him with the gift of eyesight. Dharma's words were, "you were blind in both eyes. In recompense I now grant sight in those, plus one additional eye that can also see." Shiva was very pleased. He bowed down at the Lord's feet and began to sing his praise. He then preyed to Dharma, asking him to bless his two brothers with eyesight as well. 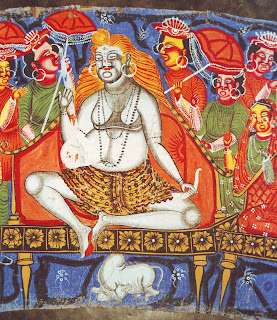 Dharma then explained to Shiva that his spittle would be enough to bring sight to both his brothers. Shiva then used his spittle and blessed both his brothers with divine vision. The three brothers next went together to visit Adi Shakti. Dharma then commanded Brahma to create the world. 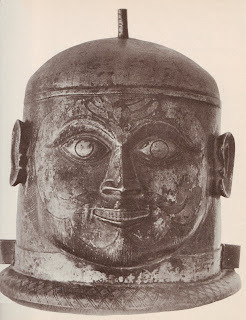 He charged Vishnu with protecting it and asked the three eyed Shiva to assume the task of destroying it. Then Dharma turned to Adishakti and asked her to take on the work of giving birth to all creatures. But Shakti responded in puzzlement asking, "How am I to bring forth creatures in this world? I was born without parents and I do not posses the power of conception. Oh, master, what shall I do to carry out your orders?" Lord Dharma then asked her to follow his advice. 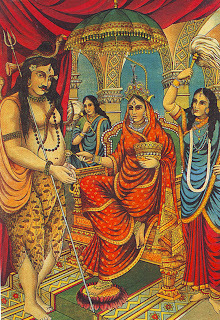 She was to marry Lord Shiva once in each of her many births to come. Adi Shakti agreed. 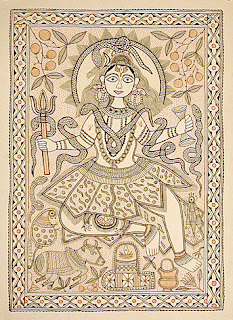 The fruit of her union was the birth of the many creatures in this world.